E Asgarani, M Shirzad, M Soudi, H Shahmohammadi. Study On The Effects Of 60Co Gamma-Rays, Ultraviolet Light (UV), And Hydrogen Peroxide On Haloferax IRU. The Internet Journal of Microbiology. 2006 Volume 3 Number 1. Halobacterium salinarum, and E.coli B/r were 645, 400, and 99 Gy, respectively, by exposure to 60 Co gamma- rays. They were 231, 246, and 9 J/m 2 , respectively, by exposure to UV light, and 22, 43.5, and 3 mM, by exposure to hydrogen peroxide. Against these agents, Haloferax IRU was much more resistant than E. coli B/r. This is the first report of the resistibility in this member of Archaea. A highly radioresistant archaebacterium isolated from the water of a salt lake located near Uromia city, west-north of Iran. The organism is a gram-negative, pleomorphic coccoid, and was assigned to the genus haloferax primarily on the basis of morphological, cultural, and physiological considerations. Very highly radioresistant bacterium, Rubrobacter radiotolerans, contains red pigments which are mainely bacterioruberin (Saito et al. 1994) with high OH radical-scavenging activity (Saito et al. 1997). Bacterioruberin had been also found in Halobacteria (Kelly et al. 1970, Kushwaha et al. 1975), represented by Haloferax mediterranea growing in highly concentrated salt media (D , Souza et al. 1997). The first purpose of this study was to determine whether or not this extreme halophilic archaeon also had highly protective character against ionizing radiation. In natural inhabit, Haloferax IRU is constantly exposed to intense irradiation of sun light including ultraviolet (UV). UV produces DNA lesions and causes mutagenic and/or lethal effects on organisms (Friedberg et al. 1995). The second goal of this study was to compare its resistibility to ultraviolet (UV) light. Presently, photoreactivation to UV light (Sharma et al. 1984), and dark excision repair (McCready 1996, Baliga et al. 2004) are well known in Halobacteria. In addition, protective actions of bacterioruberin and intracellular KCl against DNA-damaging agents (Shahmohammadi et al. 1998) were other acceptable explanations for its resistance. We also examined it , s withstand to lethal effects of hydrogen peroxide, an oxidative damaging agent. In our previous work, it has been shown that H. salinarum is highly resistant to the lethal effects of DNA-damaging agents (Shahmohammadi et al. 1997). We report here that Haloferax IRU, another member of extreme halophilic archaea also exhibits high resistance against ionizing radiation, ultraviolet light (UV), and hydrogen peroxide. It is interesting to find common features and elucidate molecular mechanisms involved in the resistance in Archaea. Organisms and growth conditions. Haloferax IRU was isolated from the water of Uromia salt lake near Uromia city, Iran. Uromia salt lake is a saturated brine with NaCl concentration about 30% [wt/vol] or 5 M. Halobacterium salinarum NRC 34002 was kindly supplied by Dr. S. C. Kushwaha. Complex medium (CM) of Sehgal and Gibbons (1960) was used for growth of these bacteria, containing 200 g NaCl, 2 g KCl, 20 g MgSO4.7H2O, 2.3 mg FeCl2.4H2O, 3 g trisodium citrate, 10 g yeast extract (Merck), 7.5 g Bacto-casamino acid (Difco) and 8.33 ml glycerol per liter of distilled water. The solutions containing the salts and organic nutrients were autoclaved separately at 120 o C for 10 min, allowed to cool and combined, then adjusted to pH 6.86, and finally autoclaved again at 120 o C for 20 min. Cells were grown with shaking at 37 o C for 48 hours in this fresh medium. Cells at logarithmic phase were collected by centrifugation at 3,000 ×g for 10 min, washed three times, and then resuspended at a concentration of 10 7 cells/ml. Twenty percent NaCl solution was used for cell washing and resuspension. Escherichia coli B/r, a radioresistant mutant of E. coli B, was kindly supplied by Dr. S. Kondo. To grow this bacterium, Luria Bertani medium (LB) was used, containing 10 g NaCl, 10 g polypeptone and 5 g yeast extract per liter of distilled water, adjusting to pH 6.8. Cells were grown up at 37 o C for 3 hours. Cells at logarithmic phase were collected by centrifugation, washed and then resuspended by the same way as mentioned above. Phosphate buffer (67 mM, pH 6.8) was used for cell washing and resuspension. Gamma-Irradiation. The cell suspension (3 ml, 10 7 cells/ml) was irradiated in a 5 ml glass tube with 60 Co γrays at a dose rate of 0.5 Gy/s at 0 o C. Colony counting on the agar plates after incubation at 37 o C for 2-3 weeks for (Hfx. Radiotolerans and H. salinarum) and for over night for (E. coli B/r). For preparation of agar medium, 1.5% agar was added to each medium. UV-Irradiotion. The cell suspension (5 ml, 10 7 cells/ml) was irradiated in an open Petri dish ( 5 cm) at a distance of 40 cm from a 30- watt germicidal lamp (HULI. T8-GL) having an intensity of 4 J/m 2 /sec. The suspension was stirred with a magnetic stirrer during exposure. Subsequent experiments were done under yellow light. Colony counting on the agar plates was performed by the same way as for γirradiation. Treatment with H2O2. Hydrogen peroxide (final concentration 5-30 mM) and (10-50 mM) was added to 5 ml freshly prepared cell suspension of Haloferax IRU and H. salinarum, respectively, in 20% NaCl. Various doses of H2O2 (2-8 mM) was added to E. coli B/r cell suspension in phosphate buffer. After incubation at 37 o C for 1 hour, cells were collected and plated with suitable dilution on the agar plates, and colony counting was performed as described above. Their D37 values were 645 Gy, 400 Gy, and 99 Gy, respectively. 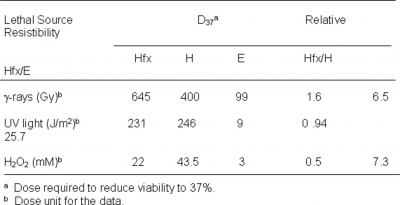 Haloferax IRU shows considerably high resistance to ionizing radiation. The resistance of Haloferax IRU was more than these two radioresistant bacteria. Fig. 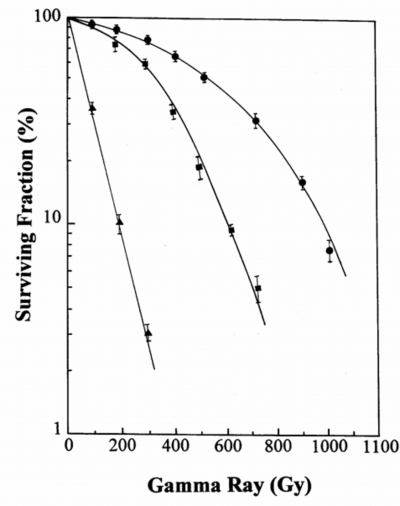 2 shows survival curves of these three bacteria by irradiation with UV light. Their D37 values were 231 J/m 2 , 246 J/m 2 , and 9 J/m 2 , respectively. Haloferax IRU was much more resistant than E. coli B/r, while its resistibility was almost similar to that of H.salinarum. Fig. 3 shows survival curves of these three bateria by exposure to hydrogen peroxide. Their D37 values were 22 mM, 43.5 mM, and 3 mM, respectively. Haloferax IRU exhibited high resistance against hydrogen peroxide that produces free radicals. The results obtained in the present study are summarized in Table 1. It is apparent from the data that the withstand to the lethal effects of UV light, rays, and hydrogen peroxide of Haloferax IRU is greater than that of E. coli B/r. Table 1: D values and relative resistibility to γ-rays, UV light, and hydrogen peroxide (HO) for IRU (Hfx), (H), and B/r (E). To the lethal effects of γ rays, the resistibility factor of Haloferax IRU in comparison with E. coli B/r was 6.5. We have some suggestions for more resistance of Haloferax IRU in compared with E. coli B/r. Very concentrated NaCl solution was used as the medium of Haloferax IRU, while the concentration of intracellular KCl is much more than NaCl (unpublished data). It has been demonstrated that intracellular KCl has protective role in the resistance of H. salinarum (Shahmohammadi et al. 1998, Asgarani et al. 1998). On the other hand it has been documented that an extremely radioresistant bacterium, Rubrobacter radiotolerans, has bacterioruberin as the main pigment (Saito et al. 1994), which contains 13 conjugated double bonds, and is a very efficient scavenger of OH radicals (Saito et al. 1997). This pigment was also found in Halobacteria (Kelly et al. 1970, Kushwaha 1975) and Haloferax (D , Souza et al. 1997). It has been shown that colourless mutant of H. salinarum is more radiation sensitive than the wild type (Shahmohammadi 1998), and also bacterioruberin has been found to has a protective role against DNA-damaging agents including ionizing radiation (Shahmohammadi et al. 1998, Asgarani et al. 1999). Thus, the resistance of Haloferax IRU to γirradiation may be partly attributable to high intracellular KCl and the presence of bacterioruberin. But these can not be the sole explanation for the high resistance of this organism and it is also supposed that a very active repair system to remove DNA damages induced by ionizing radiation exists in this extreme halophilic archaebacterium. To the lethal effects of UV light, the resistibility factor of Hfx. radiotolerans in comparison with E. coli B/r was 25.7. The photoreactivation and the lack of dark excision repair are well known in Halobacteria. This experiment, however, was performed under yellow light to avoid photoreactivation. Therefore, the present results suggest the several possibilities that bacterioruberin in Hfx. radiotolerans cells strongly scavenges active oxygen species or acts as an UV energy absorber. Previously, it is reported that bacterioruberin has radical scavenging ability in response to lethal effects of UV light in another member of Archaeae, H. salinarum (Shahmohammadi et al. 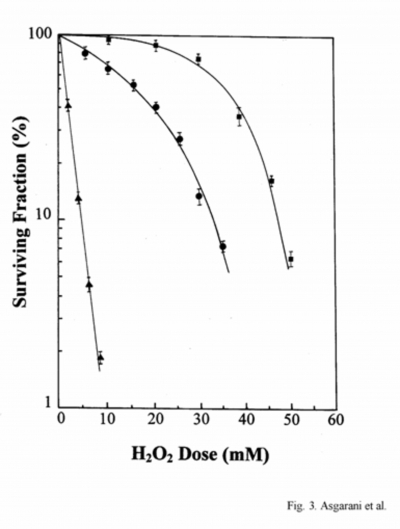 1998).The protective role of bacterioruberin seems to be more efficient in UV-radiation compared with ionizing radiation and hydrogen peroxide. 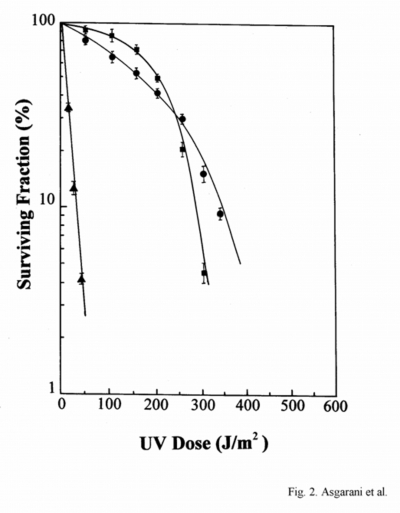 One possible explanation for more efficient protection against UV is that bacterioruberin may play an extra protective role in UV-radiation, e.g., UV energy absorbent. There is also a suggestion that carotenoid pigments might aid in the recovery from UV damage by supplying energy indirectly to the photoreactivating enzyme for the reversal of thymine dimers (Krinsky et al. 1994). It is also possible some special enzymes exist for repair of pyrimidine dimers produced by UV irradiation. The reason should be thoroughly investigated in future. To the lethal effects of hydrogen peroxide, the resistibility factor of Hfx. radiotolerans in comparison with E.coli B/r was 7.3. The value of 7.3 in hydrogen peroxide was higher than the value of 6.5 in γirradiation. Some factors, such as difference in the DNA repair capacities might be involved in the higher resistibility of Hfx. radiotolerans than E. coli B/r. Concerning this inducible repair capacities by hydrogen peroxide enhance the survival of E. coli after exposure to X-rays, but not to UV (Zhag. 1996). These findings may also have some relations with the resistibility difference to UV and γrays among the bacteria as described above. Hydrogen peroxide as same as γ-irradiation generates hydroxyl radicals, the most toxic species of the reactive oxygen species. It has been shown that bacterioruberin (which contains 13 conjugated double bonds) scavenges hydroxyl radicals much more efficiently than β-carotene (which contains only 9 conjugated double bonds), and that the highly conjugated double bonds of bacterioruberin may act as a more effective oxidation protector (Saito et al. 1997). In addition to the characteristic carotenoids, Hfx. Radiotolerans contains highly concentrated potassium cations (K + ) and chloride anions (Cl - ) in the cell (unpublished data). In previous work, we showed that accumulated ions modulate the formation of DNA damage by ionizing radiation, since Cl - has an ability to scavenge hydroxyl radicals via electron transfer (Ward and Kuo 1968), thereby contributing to the resistance of H. Salinarum (Shahmohammadi et al. 1998, Asgarani et al. 1999). Therefore, high resistance of Hfx. radiotolerans can be partly due to the presence of bacterioruberin and high concentration of intracellular KCl. However, resistibility difference between Hfx. radiotolerans and H. salinarum, which are two members of extreme halophilic Archaea, is more difficult for investigating. It is supposed that some diversities in cell membrane components, and also repair systems involved in their responses to hydrogen peroxide, can lead to different resistibility against this oxidative agent. According to these findings, Hfx. radiotolerans exhibits much more resistance against all DNA damaging agents used in this study, in comparison with E. coli B/r. On the other hand, in two members of extreme halophilic archaebacteria, although Hfx. radiotolerans responses to lethal effects of UV is almost similar to that H. salinarum, but surprisingly, it shows higher resistibility than H.salinarum against ionizing radiation, whereas, its resistance to hydrogen proxide is about half of H. salinarum. Elucidation of the exact role played by bacterioruberin in this resistibility awaits isolation of colorless mutant. In addition, purification some enzymes such as catalase which actively repair DNA damages produced by agents will be necessary to explain their exact roles in this resistibility. r-0. Asgarani, E., Funamizu, H., saito, T., Shahmohammadi, H. R., Terato, H., Ohyama, Y., Ohtsuka, E., Ide, H. (1998): Protection mechanisms of DNA damage in H. salinarum. Nucleic Acids Symposium Series. 39, 179-180, Oxford University Press. r-1. Asgarani, E., Funamizu, H., saito, T.,Terato, H., Ohyama, Y., Yamamoto, O., Ide, H. (1999): Mechanisms of DNA Protection in H. salinarium, an extremely halophilic bacterium. Microbiol. Res. 154, 185-190.
r-2. Carbonneau, M. A., Melin, A. M., Perromat, A., Clerc, M. (1998): The action of free radicals on Deinococcus radiodurans carotenoids. Arch. Biochem. Biophys. 275, 244-251.
mediterranei to low concentration of NaCl (<20%) in the growth medium. Arch. Microbiol. 168, 68-71.
r-4. Friedberg, E. C., Walker, G. C., Siede, W. (1995): DNA repair and mutagenesis, American Society for microbiology, Washington D. C.
r-5. Grey, V. L., Fitt, P. S. (1976): Evidence for the lack of deoxyribonucleic acid dark- repair in Halobacterium cutirubrum. Biochem. J. 156, 569-575.
r-6. Kelly, M., Norgard, S., Liaaen,-Jensen, S. (1970): Bacterial carotenoids, 31. C50- carotenoids. Carotenoids of Halobacterium salinarium, especially bacterioruberin. Acta. Chem. Scand. 24, 2169-2182.
r-7. Krinsky, N. I. (1994): The biological properties of carotenoids. Pure Appl. Chem. 66, 1003-1010.
r-8. Kushwaha, S. C., Kramer, J. K. G., Kates, M. (1975): Isolation and characterization of C50-carotenoid pigments and other polar isoprenoids from Halobacterium cutirubrum. Biochem. Biophys. Acta. 398, 303-314.
r-9. Saito, T., Terato, H., Yamamoto, O. (1994): Pigments of Rubrobacter radiotolerans. Arch. Microbio. 162, 414-421.
r-10. Saito, T., Miyabe, Y., Ide, H., Yamamoto, O. (1997): Hydroxyl radical scavenging ability of bacterioruberin. Radiat. Phys. Chem. 50, 267-269.
r-11. Shahmohammadi, H. R., Asgarani, E., Terato, H., Ide, H. Yamamoto, O. (1997): Effects of 60Co gamma-rays, ultraviolet light, and mitomycin C on Halobacterium salinarium and Thiobacillus intermedius. J. Radiat. Res. 38, 37-43.
r-12. Shahmohammadi, H. R., Asgarani, E., Terato, H., Saito, T., Ohyama, Y., Gekko, K., Yamamoto, O., Ide, H. (1998): Protective roles of bacterioruberin and intracellular KCl in the resistance of Halobacterium salinarium against DNA-damaging agents. J. Radiat. Res. 39, 251-262.
r-13. Sharma, N., Hepburn, D., Fitt, P. S. (1984): Photoreactivation in pigmented extreme Halophiles. Biochem. Biophys. Acta. 799, 135-142.
r-14. Zhang, Q., takemoto, T., Mito, S., Yonei, S. (1996): Induction of repair capacity for oxidatively damaged DNA as a component of peroxide stress response in Escherichia coli. J. Radiat. Res. 37, 171-176.